Good communication with seller. Great product fast delivery. Quality products!!! Fast shipping!!! Very happy!!! AAA+++!!! Great Seller!!!! Smooth transaction. ...... Item as described. Recommended!!! Easy transaction. Just as described. Thank you! A+++++++++++++++++ seller. Product as described. Fast shipping. Thanks. When I purchased this lens, it was mistakenly represented by the seller as an IS lens. Unfortunately, Canon never made an IS version of the 24-70L 2.8, and even the newer version II still lacks image stabilization. I still purchased this lens because I knew all of the positive attributes that it had, and prefer it over the 24-105L f4 which does have the IS feature. This lens is clear and bright, has a 2.8 fixed aperture over the entire zoom range. You can still hand hold at slower shutter speeds in fading light with great effect. 2.8 also gives a nice bokeh. To me, the operating range of focal length is perfect for everyday use, and when I need extended range I switch over to the 70-200L f2.8 IS or the 70-300L f4-5.6 with its newer IS. You hear the term "walk around" lens a lot, but in this case it really is true. This is the lens you will want on the camera 9 times out of 10. And on a crop sensor body, you don't have to worry about any of the perimeter distortions that may show up. The Image Stabilization is a deal maker. I've had the 24-70 f4 for about 5 months now. I worried about making the wrong choice here . . .debating between several lenses. Here's what I really like about this lens. 1. It's sharp . . .I'd have to get a computer program to determine the difference in sharpness between this and my 135L. But, all camera's and lenses seem to have their own personalities. You have to build a relationship with each one before you can appreciate what they can do. 2. The size and weight . . .it simply allows me to move it around easier than the larger 24-70 2.8. However, the big plus is holding it up for a extended period of time when video taping. The less weight , the better when trying to hold a camera over your head for a while to get a shot. 3. The IS. . .honestly, I didn't think the image stabilization was going to be a big deal for me. I had the 17-40 and the 135L, the 85 , , ,,I could get the shot normally. However, this past weekend, I did several handheld video clips of Bluegrass bands. The quality was way better than I was expecting. The hand shaking is noticeable, but, a small fraction of trying the same shot with my other lenses(I tried and failed). The IS on the lens is really awesome. Not sure if I can post a youtube link, but, try this https://youtu.be/_nLiu4IdJII You will need to copy and paste the link. This was one of my first attempts at video. I hadn't planned this . . .just decided the opportunity was there. I found it easy to hold the camera/lens combo and move it around to create different angles . . .gives me a lot of creative possibilities. Not limited to a tripod. The Image Stabilization turned out to be a very valuable asset on this lens. Overall, I do love the lens. I sold my 24-70 mm f/2.8 ii, bought the f/4 and had about $700 in cash to play with. I have not had time to compare the image quality, but so far I cannot tell the difference. I do like that I can use the F/4 to do video because of its image stabilization, which the f/2.8 did not have. I use a Canon 5D III, so high ISO is not a major factor in low light situations, meaning I don't have to use the f/2.8 anyway. This is a good lens, and L lens, so you will not be making a mistake by buying it. The 50 mm soft range that I have read so much about does not appear in my lens. I've owned two mid-range Canon L series lenses, the 24-105mm f/4 L and now the 24-70mm f/4 L. I'll avoid trying to be what I'm not...some technical expert on lenses. I'll simply say both lenses work well but I prefer the 24-70mm lens if for no other reason than the slightly smaller size. I'm 66 years old and image stabilization is a must for me now. The 24-70mm lens is sharp, delivers great results, and feels like it's built to last. I hope to pair it with the 70-200mm f/4 L IS lens when my budget allows. 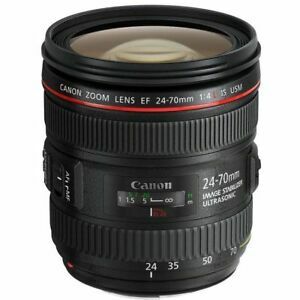 I'm using this lens with my Canon 1D MK III camera. The Mark III, like many of the newer cameras, has auto ISO and the ability to deliver noise free pictures at relatively high ISO settings. This makes the F/4 limitation a non-issue for me and saves me the expense and weight of the f/2.8 version of this lens. I'm very pleased with this lens and I think you will be too. I love this lens, but for some reason, on a metabones 3 adapter it only worked sporatically. One minute it worked on my Sony a7r II, and the next it was totally dead! Then after playing with it for a few minutes it would magically start up again! So for me, this was way way to incontinent! I also have a 16-35 L series lens that works perfectly on the same rig---so I am guessing that it was something wrong with the Canon 24-70 F/4. Just bad luck--but the supplier came through like a champ and took the lens back.